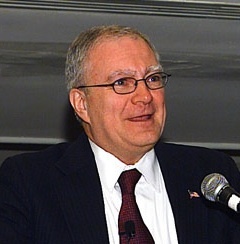 John Marburger directed the Office of Science and Technology Policy in the administration of President George W. Bush. His health failing, Dr. John H. Marburger III (who also goes as Jack) stepped down from his post as Vice President for Research at Stony Brook University last month. Samuel Stanley, the president of Stony Brook, made the official announcement yesterday. Marburger clearly relished a challenge; the Bush administration must have been a difficult environment for a scientist to work in. Though he was criticized for defending the administration against allegations of distorting and ignoring science, Marburger also spoke up to defend scientific ideals. I deeply admire his bravery during a dark time for science. I asked Marburger for an interview a few weeks ago, and he declined. But had a few things to say to us, which he put in a email. I think you will be touched by their wisdom just as I was. Here is the email exchange between us (with only a few personal sentences removed). postdoc to PI survive today’s economic crunch. I would like to help, but I regret that my health is failing very rapidly. I have non-Hodgkins lymphoma that is getting worse by the day and I’m spending all my time getting my life organized so even a short interview is difficult for me. If I had one piece of advice to offer on your topic it would be “focus on excellence and content.” Spend time becoming the best that you can be in your chosen field. You don’t have to be brilliant to be successful in science, but you do have to love what you’re doing and do it reliably and without slick salesmanship. Passion comes through clearly and everyone loves to see it in action. A scientist who loves their work can motivate an entire laboratory and provide a spark that helps everyone be more creative and successful. When it comes to getting funding or having people support your ideas, nothing is more important that showing integrity, competence, and a passion for whatever you’re doing. It also helps to know what your sponsor wants and to try to help him/her become successful. You want to know how your talents can help your sponsor succeed. If they succeed, you will succeed.